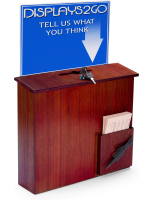 Want to use a comment or suggestion box for employees at the office, but need one that matches a certain décor? 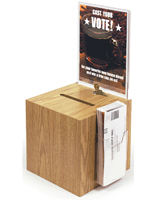 These wooden ballot boxes offer a high-end look at affordable costs. 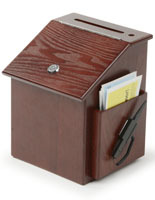 This wood suggestion box features a variety of different designs and different finishes. Choose from light oak, dark oak, mahogany or a black finish! 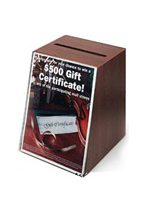 All these displays are ideal for collecting suggestion forms, comment slips and money. 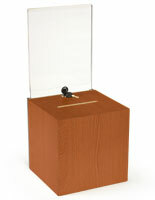 These wood suggestion boxes are locking to keep the contents of the display safe and prevent any tampering. 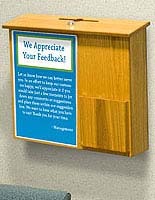 The finish of these comment bins really stands out from competing products and will really look great in any setting! 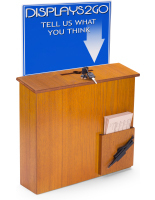 What are the key features of this suggestion box? 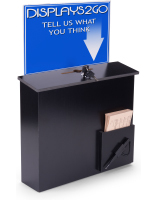 This suggestion box can really send a message and some positive vibes throughout the workplace. Managers putting up a registration box show that they are open to the opinions of employees. Feedback is one of the best ways to continually improve and get better. 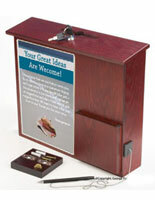 Improve the spirits of any business with a suggestion box that is wooden. 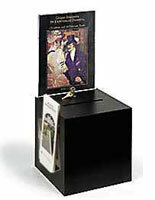 These displays can also be place on countertops or wall mounted. With so much versatility they can be placed nearly anywhere. 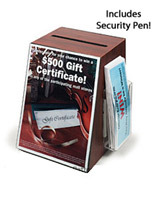 The pocket and security pen allow everything needed to use these comment boxes directly on hand. 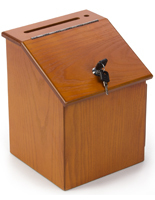 Use these boxes for charities and fundraising as well! 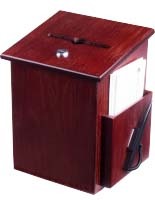 Many of these ballot boxes feature an area for signage on the front. There are also some that feature signage areas above the display to draw even more attention to it. Advertise for a specific cause or charity so donors know what they are giving towards. When people can associate donations with an actual group they are much more likely to contribute some of their own funds. By putting these displays in a central location, donations and contributions can add up in no time. People walking by a box for charity multiple times are eventually going to feel obliged to donate to a worthy cause. Use these boxes in a school setting! 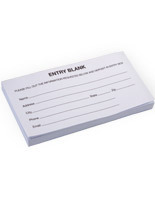 Host class elections and have students vote by submitting a piece of paper into the bin. They can also be used to aggregate ideas from all the students. 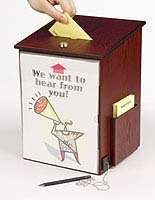 Many students may be too shy to share an issue or a specific idea, but with this comment box they may be more likely to write something down and submit it to the teacher. Try asking a “Question of The Day” in the classroom to get more participation. 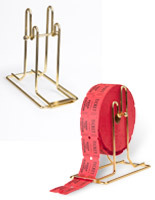 Have students submit an answer with their name and one randomly chosen correct answer will receive a prize! 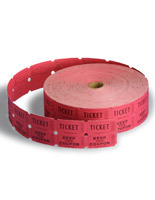 By giving away prizes students will feel rewarded and likely more eager to participate in daily lesson plans. 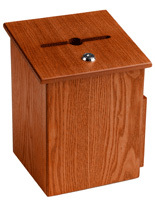 Check out the main category for comment boxes to browse through a selection of various other styles and materials. 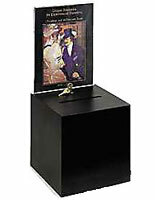 Acrylic and metal boxes are also sold on this site. 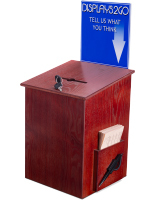 Check out some of the floor standing models for a more noticeable and prominent display. 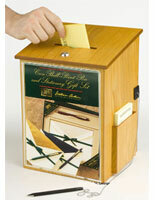 The wide selection of colors and styles allows you to match a ballot box to any setting. This website also features plenty of other products that are ideal for using as advertisements for retail stores. Having trouble drawing people in from sidewalks when they walk by your store? We can fix that. Browse our selection of window signs and frames, along with A-frames. Try mounting a TV in the window to run custom slide shows or live TV. We also have a huge selection of restaurant displays to improve any dining facility. The main catalog for this site currently features more than 4,000 unique SKUs. 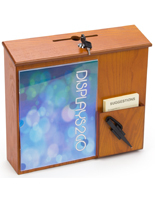 Displays2Go orders can be placed online or over the phone today.